I’ve been recommending a daily practice of regular donor thank you calls to both my clients and subscribers ever since I first ran across this 2006 article from Hildy Gottlieb. Regular board thank-a-thons provide a marvelous opportunity to engage your board in introductory fundraising activities, sans the dreaded ask. And the daily practice of thank you calls goes a long way towards instilling an organizational attitude of gratitude that’s downright contagious. So, getting back to Kieran’s question, is it ‘creepy’ to look up a number in the White Pages in order to make a thank you call? Mary goes on to say, “And speaking as someone who growls every time the phone rings, even phone-grouch me has been pleasantly surprised with a “just thanks” call. But I do agree that there’s a difference between not having the phone number and having the donor not give it to you when directly asked for it. So…what about the practice of requiring a phone number on an online donation form? I typically recommend including the field for a phone number, but not making it required. 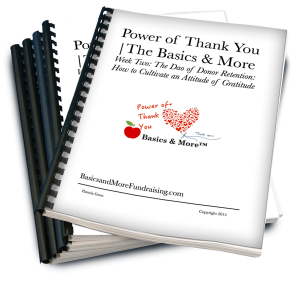 If you’re looking to rock your organization’s thank you letters for any eventuality, ways to get your board and entire team involved in your donor retention processes, and so much more, my crazy popular Basics & More course, The Power of Thank You returns for an encore performance in spring of 2015. This is the training where Claire Axelrad and I walk your organization, step-by-step, through your donor service procedures. The course is loaded with unlisted scripts, bonuses, and recorded webinar trainings (you’ll be surprised and delighted). What if the nature of your organization prevents donor calls? Subscriber Rebecca Taguma of The Tagumas wrote, “Just a quick comment to the call vs card/email debate. We live overseas, so I do not call, unless we are Stateside. I’ve always believed that handwritten thanks are more personal, since calls are a non-option for us, so I save them up and send them back to the US with folks headed that direction whenever I’m able to. But recently I ended up emailing some thank yous to donors because it was going to be way too long between the gift and the thank you. The response was amazing! Unlike a card which is unidirectional, an email is easily replied to. Almost every personalized e-thank or FB message (for the folks whose email I didn’t possess) I sent opened up a conversation with the donor. I won’t do away with the cards because frankly I don’t have enough time to keep the conversation going, but email is my new go-to for personalized thanks.